Now that I know the old shed has tranformed into an insulated, heated cabin that can withstand the winter weather, I can officially call it a homestead. Lot’s of things to do such as building a greenhouse and preparing to put in a garden. Maybe even some livestock. Chickens or rabbits most likely but not cows. We’ll see. The goal is turn the place into a self-sufficient homestead. 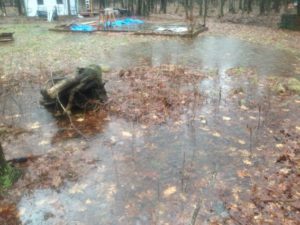 But this January thaw and heavy rain has brought up another problem. I need to dig a drainage ditch. 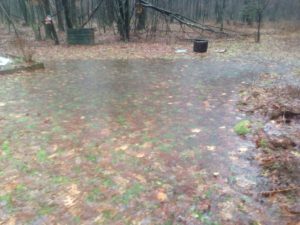 With the amount of ground water I may actually start a spring.